A wheelchair van and police wait for the removal of protesters at HHS Secretary Alex Azar's home on Sunday. INDIANAPOLIS — Dozens of protesters, many in wheelchairs, demonstrated Sunday outside the Northside Indianapolis home of a member of President Donald Trump's Cabinet. The protesters from ADAPT chanted and hoisted signs at the home of Health and Human Services Secretary Alex Azar, near 75th Street and Washington Boulevard, in Meridian Hills. ADAPT, a national advocacy group for the disabled, says the protest was meant to draw attention to its claim that shock devices are used on developmentally disabled patients at the Judge Rotenberg Educational Center in Canton, Mass., and the Food and Drug Administration has stalled on rules on that would end the practice. 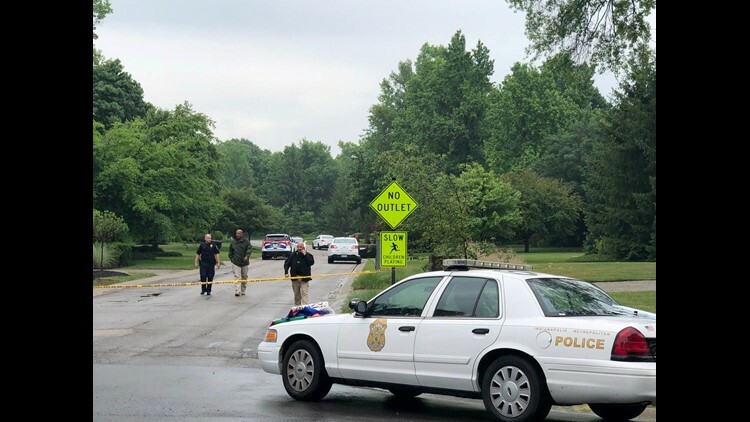 The protesters told IndyStar they arrived at the home around 6 a.m. Sunday and would remain there until either Azar took action to have the shock devices banned, or until they were forcibly removed. "They get shocked from 12 to 34 times a day for not taking off their jacket ... anything that they're not supposed to be doing. Going to the bathroom when they're not supposed to, they get shocked for it," said ADAPT member Chancelor Shingleton. "So we're to talk to Alex Azar at his property ... the lights were on at the house. As soon as we started chanting, they turned off the lights and dogs came." Shingleton said police were called, and the group settled in for a long demonstration. "Right now we're at a standstill," he said. "It's a simple piece of paper that stops harm being done to children with disabilities everyday. That's all we want. We just want a child with disabilities to live an average life like we do. All it takes is his signature." As heavy showers soaked the protesters, repeated chants of "Shame of Alex!" could be heard throughout the neighborhood of $1 million homes. 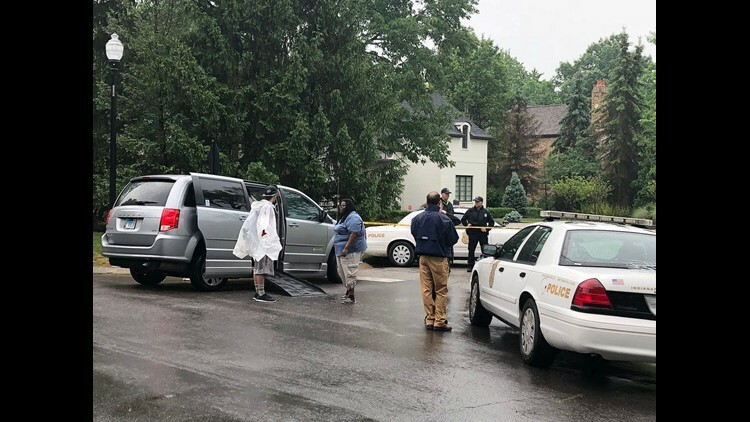 Because they were on private property, ADAPT's presence led to Indianapolis police, fire and EMS being called to the scene to diffuse the situation, and provide aid if needed. The police cars that lined the streets caused a scene and disturbed community members. Countless motorists and pedestrians stopped to seek answers from police and media gathered near police tape that stretched across Washington Boulevard. Catherine Wade, a north-side resident who was walking byduring the protest, said she feared that someone had been killed when she approached. "There are just so many police cars and lights and officers ... it looks like a murder scene," she said. "I'm so glad that no one is hurt, but it is very scary to wake up to all this on Sunday morning. I pray this all ends peacefully." According to the Indianapolis Metropolitan Police, protesters who refused to leave faced trespassing charges and would be removed from the property. A large number of the protestors did not disperse, so officials called in wheelchair accessible buses and other vehicles to transport the disabled protesters. Police block streets in Meridian Hills after a protest Sunday at the home of HHS Secretary Alex Azar. ADAPT said it had more than 50 people demonstrating. Police at the scene told IndyStar around 11 a.m. Sunday that about 24 demonstrators were facing possible arrest. Azar is a former Eli Lilly and Co. executive and now oversees the FDA as the HHS secretary. He often spends weekends in Indianapolis, but it is unknown if was home during the demonstration. #ADAPTandRESIST chanting "People know, #StopTheShock" as police prepare for arrests in Indianapolis outside @SecAzar's house as they have gotten no response in DC for years. HHS spokeswoman Caitlin Oakley said the organization is open to meeting with groups like ADAPT, but not on these terms. While the shock therapy ADAPT is protesting at the Judge Rotenberg Educational Center has many detractors, parents of some patients said the practice has made their children less violent, The Washington Post reported. The Rothenberg Center is the only one in the nation that uses the graduated electronic decelerator or GED. Staff members use a remote control device to administer a 2-second jolts of electricity when they think a patient is about to misbehave, The Post reported. Anita Cameron, an ADAPT organizer from the Rochester, N.Y. asserted that a 17-year-old patient at the center was shocked 31 times over seven hours for not removing his coat, according to an ADAPT news release on the protest. "Americans are being hurt and Alex Azar is allowing it to happen,” she added.